Starbucks® Doubleshot® Espresso. Espresso & cream light. 45% Fewer calories than Starbucks Doubleshot® espresso & cream. Premium espresso beverage. 70 Calories per can. 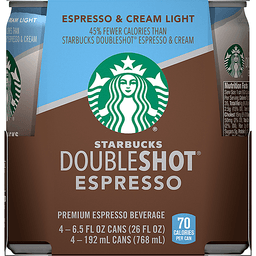 Rich, bold Starbucks® espresso with 45% fewer calories than Starbucks Doubleshot® espresso & cream. And 100% more let's do this. For comments or questions, call 1-800-211-8307. Visit us online at starbucks.com. Partially produced with genetic engineering. Starbucks, The Starbucks logo and Starbucks Doubleshot are trademarks of Starbucks Corporation. ©2016 North American Coffee Partnership. All rights reserved.